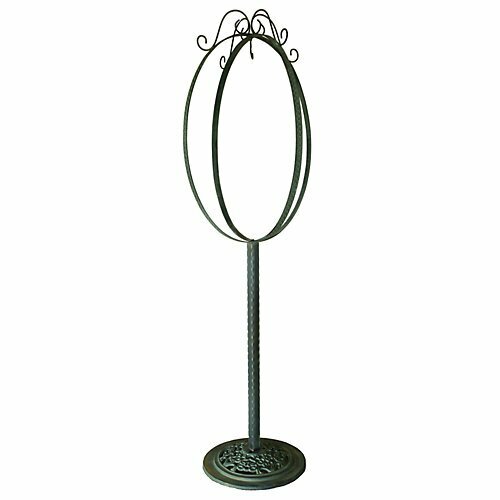 Parlour Patio Garden Hanging Stand This Garden Hook is created to compliment our hanging planters, yet are beautiful works of art! The Parlour Patio Garden Hook will accommodate a hanging planter from 12" up to 16" with a standard chain. Features: . Heavy-duty base included . Coated with Vinyl and UV Inhibitors Item Specifications: Dimensions: 20.5 x 73.5 Color: Antique Green About Austram In 1983, Austram became the first company in the US. to introduce a coconut fiber lined wire planter to the North American consumer. Today we are an industry leader, offering the most complete assortment of coco moss planters available. Our line also includes wire trellises and arbors, fence edging, plant stands, baker's racks and much, much more. As we head into the next century, our mission will be to continue: "To market high quality, innovative decorative planters and planter accessories to the North American consumer, while continuing our tradition of providing the highest value, quality and service in the Lawn and Garden Industry." If you have any questions about this product by Austram, contact us by completing and submitting the form below. If you are looking for a specif part number, please include it with your message.